Today’s Suzuki GS1000S was touched by the hand of a master, the late Barry Sheene. In an era of sullen, sanitized superstars, it’s easy to forget that there used to be some really charismatic racers, folks who not only seemed to enjoy racing, but enjoyed life. But you certainly can’t expect guys barely out of their teens to have fully-developed personalities, and “early-to-bed, early-to-rise” is the name of the game so riders can stay in peak physical condition because racing is big business, and these guys are professionals. With so much money on the line, modern riders are endlessly coached: it’s pretty difficult to remember to name-drop all those sponsors without practice. And it’s especially difficult to remember that long list just thirty seconds after competing in a grueling, dangerous race. While much of his career was spent on purebred two-stroke racing machinery, today’s bike is a highly modified GS1000S prepped by “Pops” Yoshimura. 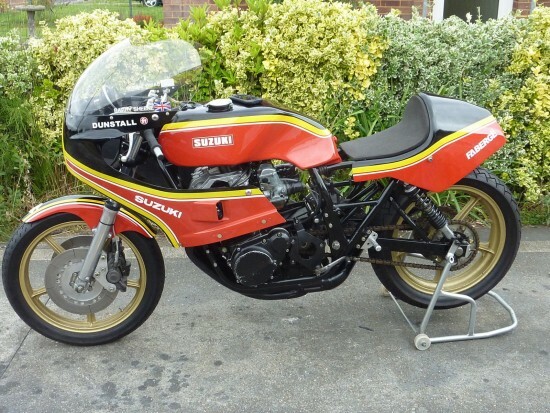 The machine offered here for sale was raced by Barry Sheene at the August bank holiday meeting at Oulton Park 1979. UK importer Heron Suzuki was interested in promoting production-based racing and asked Paul Dunstall to enter a Yoshimura prepared factory GS1000s Suzuki in TT Formula One events in 1979. Barry Sheen was the Texaco-sponsored Heron Suzuki teams number one rider in Grand Prix and his dislike of racing heavyweight four strokes was well known, once referring to them as ‘muck spreaders.’ Nevertheless Barry acquitted himself with distinction in his one off ride at Oulton Park, Finishing a close 2nd to Honda mounted Ron Haslam. 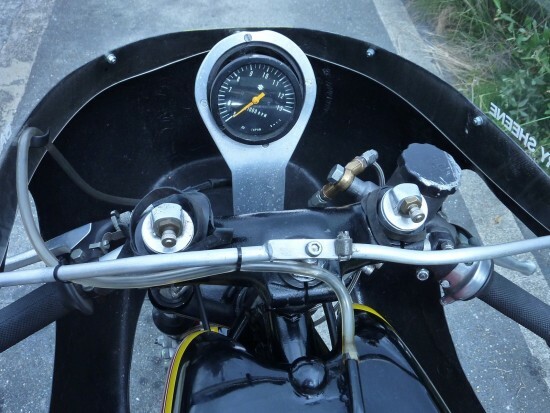 Indeed the Suzuki star might have one had he not been balked by a back marker on the final lap For its first foray into Formula 1 racing Suzuki adopted a relatively cautious approach to tuning the GS1000S roadster. 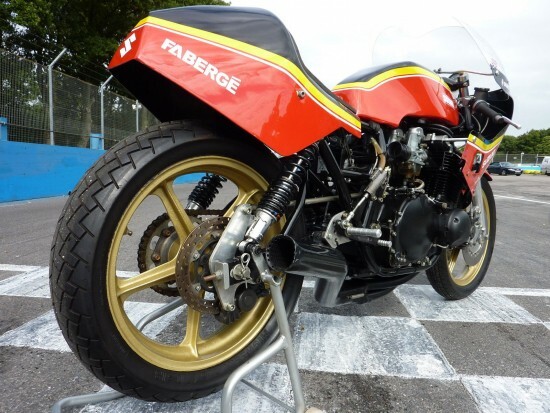 The machine offered here for sale was raced by Barry Sheene at the August bank holiday meeting at Oulton Park 1979. UK importer heron Suzuki was interested in promoting production-based racing and asked Paul Dunstall to enter a Yoshimura prepared factory GS1000s Suzuki in TT Formula One events in 1979. The machine was sent from Japan to Pops Yoshimura in California where the engine received special cams , larger inlet and exhaust valves , high compression slipper pistons, self generating ignition, close ratio gears and a stronger clutch basket , The crankshaft conrods and bottom end being left in stock . Retaining the standard 28 mm carburettors a Formula One requirement. The 1000cc tuned GS produced around 114 bhp with a wide spread of usable power . As well as other additions to inside the engine which were a Kawasaki KZ 1000 idler wheel fitted into the cylinder head below the intake cam and an inverted stock GS 750 idler roller was installed into the GS 1000 cylinder head to help keep the cam chain under control when revs were 10,000 RPM plus, reduced valve stems and enlarged valve seats, 10.5 -1 high compression slipper pistons, confirming this is an original Yoshimura race tuned F1 engine (by Pops Yoshimura). Changes to the chassis included a shorter Peckett and mcNabb swinging arm and RG 500 fork yokes. Period photographs of the Sheene Suzuki racing at Oulton Park show it equipped with only a cockpit fairing , whereas photographs taken later in the season show the type of full fairing that it also wore. 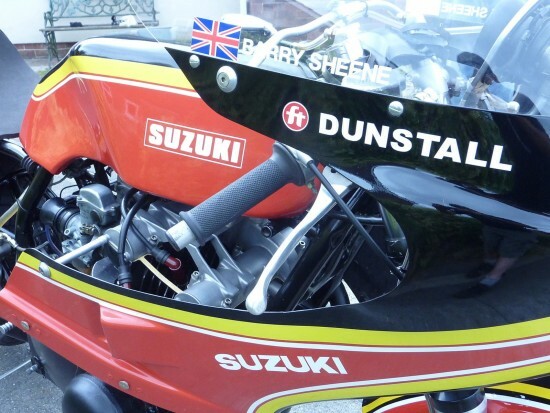 It can also be seen that this machine was equipped with a right foot gearchange as were many of Barry Sheene’s bikes. The Dunstall Suzuki teams regular riders were Steve machin and Bob Smith but Sheene’s 2nd place at Oulton park would be its best result in 1979. The Ex-Sheene Suzuki was later sold by Tony Robinson (who was involved in the running of the Suzuki Dunstall team) to Martin Jones of Muswell Hill London then sold it to Mike Ryan of Cheltenham in April 1998 then purchased by Richard Ford in June 1999, since 2002 the Suzuki has been on display in the Lake land motor museum . 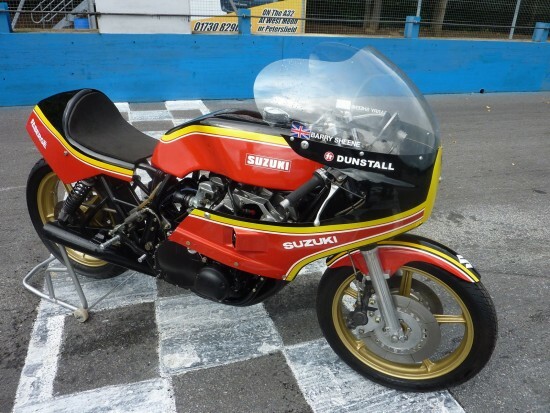 This Suzuki has not been run since being loaned to the museum but has just recently been recommissioned by Dyna tech and the present owner, only requiring new tyres to be able to race this one off classic machine . Believed the only Japanese four -stroke ever raced by the late ex-world champion (he did race a Seeley Norton in 1970 retiring with gearbox problems). 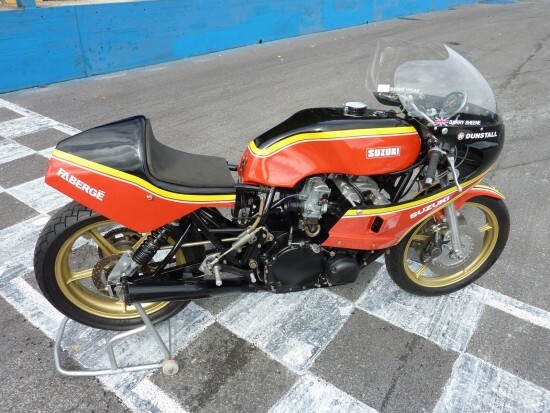 This is very rare ex-factory production racer is now offered with various bills of sale and period press cuttings tracing its history back to Tony Robinson with a bill of sale and internal engine photo’s previously sold by Bonhams as the original bike raced by Barry Sheene. What’s it really worth? Well, this is a one-of-a-kind machine that appears to be in perfectly-preserved condition, and and is ready to race. Just add tires. Sorry: “tyres.” And while it certainly isn’t as desirable as one of Barry’s two-stroke race bikes would be, it was ridden by the man himself in competition, and looks great in Heron Suzuki livery: he rode for Heron Suzuki until after the 1979 season and his famous battle with Kenny Roberts at the British Grand Prix at Silverstone would have been on a bike with these colors. A beautiful piece of racing history and touched by the man himself. WOW! This motorcycle should give the the readers at RSBFS something to comment about. Talk about rare with a racing pedigree! Huh, No comments. I must be the only one interested in this Suzook, except for the person who bought it and ended the auction early. Those guys reading RSBFS need to expand their horizons beyond RG500’s and other smokers, there are some interesting bikes over here. Too cool. Barely remember when this thing was ridden by Barry but I was too interested in 2=stroke gp bikes to pay much attention. Well,,,, until I watched Wes Cooley put in on em at Road America in ’80. This bike has my attention now. What did it sell for and where did it go?